But like any fast-growing technology sector, fintech faces some particular challenges when it comes to localization. The first problem is that for many, the need for localization has snuck up without much warning. Given the highly-regulated nature of financial services and the individual approach required by different jurisdictions, many young firms started out with a very clear focus only on their own domestic market. As fintech solutions have become better understood by regulators and confidence has grown, regulatory barriers have reduced — to the point where certain financial centres are making it as easy as possible for fintech firms to operate in new countries and jurisdictions. International revenues are now within reach for more fintech and insurtech providers than ever before. This, coupled with early success and an increase in VC funding, is great news for the sector but has left some fintech companies impatient to move into new markets but without a clear view of the localization support they need. And localization support is sorely needed. Which is the next key challenge. Fintech is a fairly generic term, which takes in widely-accepted aspects of cryptocurrency, payments, lending, and money transfer. However, depending on who you speak to it also includes elements of insurtech, regtech, and much more. Every one of these will require a subtly different localization approach — whether the focus is on the translation and localization of a consumer-facing web portal, or an analytics-driven payments or forex platform. Traditional localization companies struggle with this level of diversity, and will often assume that linguists familiar with traditional financial terminology ‘will do’, and that software engineers used to handling standard web assets can handle the complexity of all platforms. If fintech innovators and global technologists were happy to accept this level of compromise, they probably wouldn’t be doing what they’re doing today. 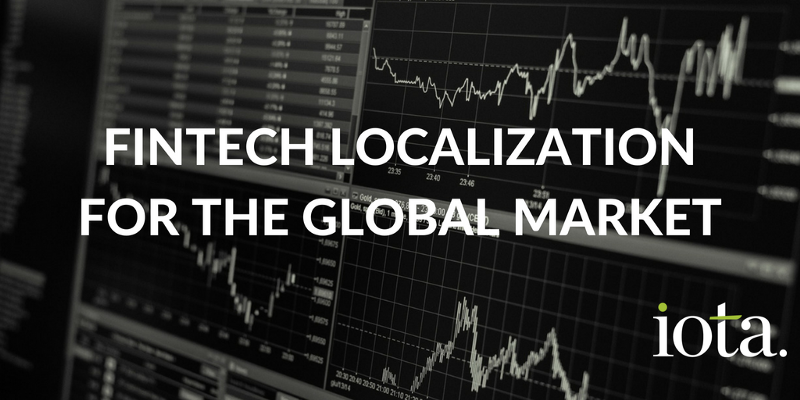 Successful fintech localization depends on flexibility, collaboration, and a willingness on the part of your localization partner to change the way they work in order to deliver the best results for you and your customers. Whilst much terminology is shared between traditional financial applications and new fintech solutions, it’s not a direct match. Changes in the way financial products are sold, communicated, and presented in the current market mean that linguists who have spent 20 years translating mortgage terms might not be best equipped to deal with the style and nuance of the text in a money transfer app. And that’s before you consider the unique terminology associated with your brand, docs and marketing messages. Given that many localization firms simply equate ‘fintech’ with ‘finance’ and plug the latter term into their database to carry out an automated search for linguists, that’s what you’re likely to end up with. Far better to work with a localization company who will take the time to understand your business, your customers, your solutions, and your top-level objectives, before hand-selecting the most appropriate linguists and engineers to complete the project. Even after taking this approach; ongoing dialogue, review, and discussion will be needed to get the best result. These conversations need to take place with people who understand the technology and what you’re trying to achieve. Not a revolving-door account manager whose primary role is as a gatekeeper. Want to pick up the phone and call the project manager or senior manager of your localization company? You should be able to do that. It will come as no surprise that in my view, Iota is best-placed to provide the flexibility and individual approach necessary for successful fintech localisation. With over a decade of experience working with market-leading businesses in the finance, cloud, analytics, and CRM space, you’ll be in good company.